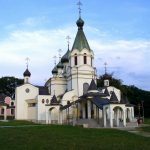 The history as well as the material and spiritual culture of Slovaks and their ancestors were formed and fundamentally shaped by the Judaeo-Christian tradition. Slovakia’s geographical position in Central Europe means that from the earliest times it has been at the crossroads of Eastern and Western influence of power, culture and spiritual traditions. The conversion to Christianity of the Slavic tribes that made up the Great Moravian Empire was largely carried out by the Byzantine mission of the Thessalonian brothers, Constantine and Methodius, who were entrusted with the mission by the Byzantine emperor Michael III in 863 at the request of the Great Moravian prince Rastislav. As a result of the arrival of a large number of East Frankish Latin clerics after 874, the Western, Latin liturgy became predominant during the reign of King Svatopluk. The invasion of the Carpathian basin by Magyar tribes at the start of the 10th century led to the collapse of the Great Moravian Empire. The land and people of Slovakia were gradually and unwillingly incorporated into the Hungarian state, where they lived and developed spiritually and culturally for a thousand years in specific conditions. The Roman Catholic church had the greatest influence on religion. However, in the 16th century the Lutheran reformation spread rapidly across the territory of Slovakia, first amongst the German population of the mining towns and later in the Slovak population of the towns and the countryside. The Calvinist reformation appealed mainly to the Hungarian population. The Roman Catholic Church regained its dominant position after an intensive Counter Reformation. During this period our ancestors were engaged in a life or death struggle with the Ottoman Empire, whose borders reached the southern part of our territory. 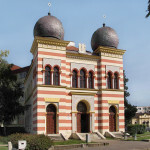 The catholic and protestant churches played a crucial role in the process of national renewal and the construction of the national identity of Slovaks. Since the end of the 19th and the start of the 20th century there has been a gradual expansion in the number of neo-Protestant churches and religious societies. Part of the Slovak history was determined by the life of the Jewish community with its specific cultural, economic and religious contribution that was tragically interrupted by the Holocaust. The vast majority of Jewish citizens were murdered by the Nazis in concentration camps and during the reprisals after the suppression of the Slovak National Uprising at the end of the Second World War. In the inter-war period churches developed and operated in a democratic system of government. A sharp change took place after the Communist coup of February 1948. The new regime saw churches as ideological opponents and did everything in their power to limit their activity and social influence. Churches found themselves under the regulatory and economic control of the state and in profound international isolation as a result of limits on their foreign contacts. This situation changed radically after November 1989, when churches were fully restored to a status comparable to that of churches in other democratic states. Legislation was passed to ensure the autonomy of churches in their external and internal activities. Churches received back property that was nationalised after 1948 and freedom of religion and worship was guaranteed. Religious freedom is a fundamental human right. Freedom of religion is guaranteed by the constitution but no one can be coerced into it. The equality of all churches in the eyes of the law is guaranteed; the state may not intervene in the liturgical or canonical affairs of the churches and religious societies and churches and religious societies shall not intervene in state affairs. 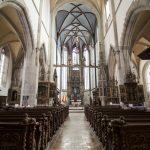 In the last census of the population, houses and dwellings in 2011, 75 per cent of the population declared membership of churches or religious societies registered in the Slovak Republic. As of 1 May 2015 there were 18 registered churches and religious societies operating in the Slovak Republic. A significant change in the perception of church-state relations was marked by the bilateral effort to establish relations and areas for co-operation on a contractual basis. Since the end of 2000, two significant changes have taken place in this area. These were the ratification of the Basic Treaty between the Slovak Republic and the Holy See signed at the Vatican on 24 November 2000, which applied to the Roman and Greek Catholic Churches, and the approval of the agreement between the Slovak Republic and the registered churches and religious societies of 11 April 2002 on the status of 11 churches, including the Jewish religious community. The democratic political system guarantees the free development not only of worship by the churches but also their engagement in the social and spiritual life of society and in charity and education. Churches and religious groups currently play an important role in the social and cultural life. A democratic state has a natural interest in ensuring that the activity of a church or religious society is in accordance with the legal system of the state and that such activity should not divide society but instead help to unite it on the principles of tolerance and mutual understanding.